We have a deep understanding of the Gaming Industry. By applying the best practices our Gaming SEO Services, we increase your organic traffic and rankings with a measurable impact on your ROI using exclusive Gaming SEO techniques and processes. Let us show you why our search marketing for the game industry works while taking your business to the "next level". Do you have Gaming SEO needs? Our team of experts are specialised in the Game Industry and SEO for gaming websites. They are here to help you every step of the way in order to assist you in creating and implementing your Gaming SEO Strategy. The objective is to increase your visibility, qualified traffic and rankings on the search engines result pages by optimizing your site, medias & content, recommend the implementation of best practices as well as analyzing your gaming niche and competition! Appart from being gaming enthusiasts (not to say geeks - our office favourite is Mario Kart 8 on Wii U), we understand the gaming industry: the studios, developpers and distributors requirements in terms of timeline, support, marketing/communication and monetization. More than that, we share the gamers needs and expectations in relation to the gaming experience, whatever the game physical support or system (computer, console, mobile, arcade, etc.). That is a major advantage when working in this industry! The United States has the largest video games presence in the world in terms of total industry employees. In 2004, the U.S. game industry as a whole was worth US$10.3 billion. U.S. gaming revenue is forecast to reach $23.5 billion in 2017, making it the second largest market behind China (Wikipedia). 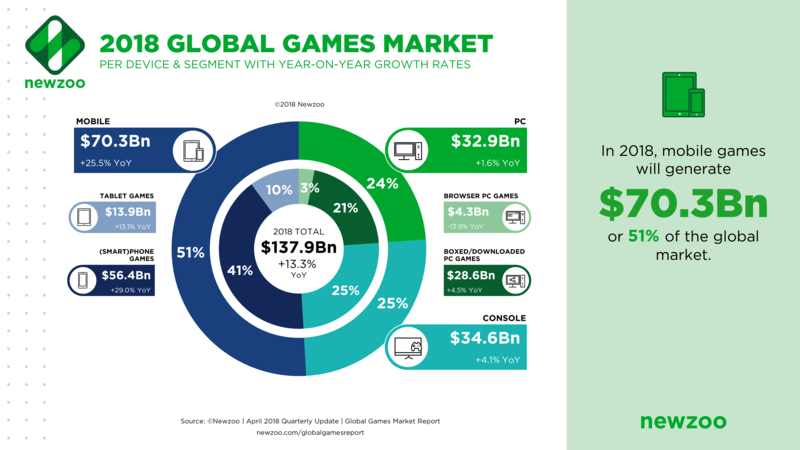 However, according to more recent data (see the graphs below), the gaming industry has increased more than expected reaching more than 70 billions USD in 2018. 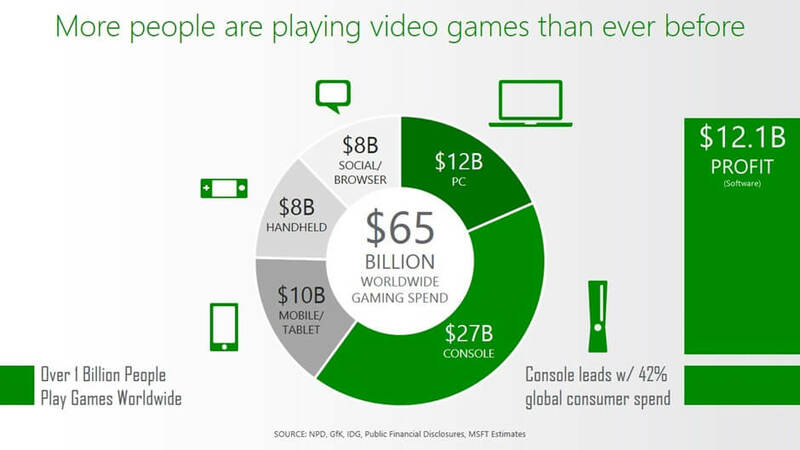 The mobile games are representing more than 50% of the revenues. As expected, people are playing more and more with access becoming easier and cheaper! 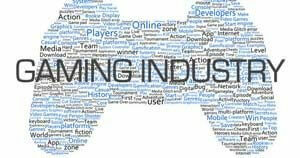 It is thus clear that the gaming industry still offers great potential and opportunities! However, it is a very competitive market in which getting noticed and having some visibility online is difficult. Launching a new game, building a community, creating relevant content and attracting players could be challenging. That is why our gaming seo experts are here for! Our Gaming SEO services include: discovering your target audience, keyword audits, strategic analysis of competitors, link building (Off-Page SEO), SEO strategy, website recommendations and activity reports on a monthly basis. Why is Gaming SEO important? As stated earlier, the gaming industry is still in growing and has already overcome the cinema industry. The prediction for the future and still in the rise and games popularity (especially for the young generations) has never been so high! Adding to that the emerging markets and the spread of high speed Internet access and you get a flourishing industry with lots of opportunities. With such an enthusiasm for games and gaming in a more general term, websites related to this topic are not missing on the Internet. Gaming websites as well as Gaming YouTubers are more than popular these days! That means that the competition is tough! However, most of those are still localized which still gives a chance to get visibility online. Whatever your niche or focus withing the gaming space, SEO for your gaming website is a must. In order to stand out of the crowd, you need to have an optimized website in correlation with your audience searches, an active community and some great content. Our gaming SEO services are 100% tailored for it! Websites placed on Google’s first page, especially on the first 3 positions, receive the most traffic (approximately 70% of the clicks). However, with a high number of strong competitors, it's necessary to apply the right SEO plan to get good rankings in the user's search results. We run an intense analysis of your direct competitors to find insights, weaknesses and opportunity gaps for your business. We create, edit, update and make recommendations for your website pages to focus on increasing qualified traffic and improve your rankings in the search results. We run a deep investigation to find out what the most relevant keywords are to your gaming business used by your audience. 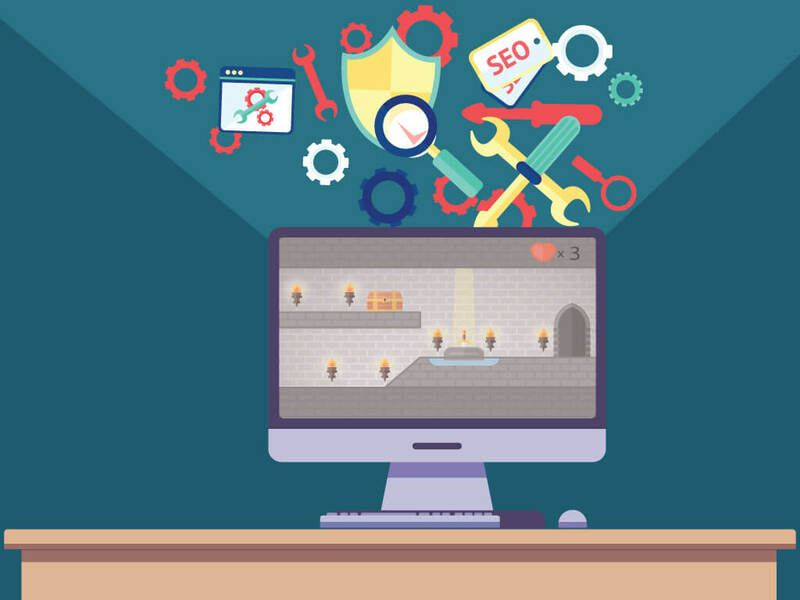 We create and execute a gaming link building strategy, building your website authority and increasing its popularity for better results on the search engines. We create highly relevant content for your users and community in relation to your gaming niche. Video, Tutorials, Walkthrough, Reviews, etc. We help you build your online community and fanbase by sharing and engaging the gamers on social media, forums and other digital plaforms.